Destroyed homes and debris are seen near Port St. Joe, Fla., on Friday, two days after Hurricane Michael hit the Florida panhandle. Analysts estimate the storm has caused billions of dollars of damage. It's still too early for a full accounting of the financial fallout. And insurance adjusters — like residents, utilities and rescue teams — have grappled with blocked roads and downed communication systems as they try to quantify the extent of the damage. 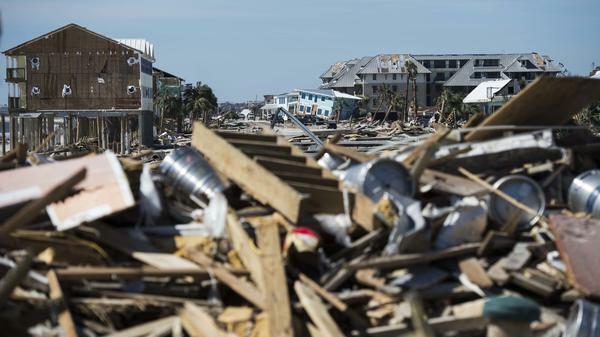 Carl Nemeth, special investigative unit manager at Tower Hill Insurance, spoke to NPR from the outskirts of Panama City, Fla., over the weekend, explaining that there were still roads that weren't safe to travel on. That has meant processing insurance claims for properties neither owners nor adjusters could yet access. "In situations like that, we're relying on aerial imagery ... so if we can't get to the site or get a look at it, at least we can get a decent picture of what's going on," he said. Tower Hill uses satellites and airplanes for those aerial views. But Chris Chandler, an adjuster with Alfa Insurance in Alabama, says some individuals, facing the same problem, are using personal drones. "I left a farm a few minutes ago — they've got two different herds of cows that they can't even get access to, there's so many trees down," Chandler said, speaking to NPR from Houston County, Ala., in the state's far southeast. "I said, 'Do you think the cows are fine?' [The farmer] said, 'I don't know ... I've got a friend that's got a drone and we're going to see if we can fly the drone and check on them ... we'll just have to see." While access problems remain, much of the damage is easy to spot. And it's not just destroyed houses, Chandler says. Agricultural communities were hit hard, with poultry houses ripped apart, timberland covered in trees snapped in half and cotton fields stripped bare by powerful winds. "There's cotton that was ready to be picked last week ... 60, 70, 100 mph plus winds come through and it just blows it away," Chandler says. "People's livelihoods depend on the crops that they have," Chandler says. "This was [going to be] a good year for for cotton ... this is going to take a lot of farmers financially really, really hard." CoreLogic, a property data company, estimates that Michael caused up to $5 billion in insured losses, while catastrophe modeling company, Karen Clark & Co., estimates the loss might be as high as $8 billion. While the damage is extensive, it's not so bad that analysts are worried about the health of the region's insurance industry. Fitch Ratings announced Friday its assessment that the industry is "well positioned to absorb the losses from Michael," even after recent losses from Hurricane Florence. Absorbing losses from disaster is, of course, what insurance companies are supposed to do. But very large and damaging storms — especially in Florida — often raise concerns about whether insurance companies can actually fulfill all their claims without going bankrupt. The industry was not equipped to handle the cost of Hurricane Andrew in 1992. After the storm, some smaller insurance companies went bankrupt, and many bigger ones backed away from offering coverage in hurricane-prone areas. Premiums went up, and for some homeowners, insurance could be hard to find. Today, Florida's home insurance market includes a state-run insurer and several smaller companies that rely heavily on reinsurance — that is, insurance for insurance companies. The system worked well after Hurricane Irma in 2017, Fitch Ratings notes, and it's expected to do the same after Michael. But the storm's financial costs will still linger. Not every loss is insured, and even homeowners and businesses that have insurance face a long and difficult recovery. Chandler, the adjuster in Alabama, says it can be emotional meeting with residents to go over their losses after the storm. "You're talking to people [whose] houses are destroyed," he says. "All their belongings, their wedding or their children's pictures, things like that are just gone. And nothing, no amount of money, is going to get an image back of your parents that are passed away. That's not going to get an image back of your child's first birthday." "You wish that you could just snap your fingers and make everything back to normal," he says. "Obviously, that's not going to happen." Next we turn to the effort to total the damage from Hurricane Michael, which hit Florida's Panhandle last week. NPR's Camila Domonoske reports. CAMILA DOMONOSKE, BYLINE: Since Hurricane Michael hit, impassable roads and non-functional phones have made life difficult for residents and rescue teams - and for insurance adjusters. CARL NEMETH: Lot of power lines down, trees down just on the outskirts. We're probably still 40 miles from where the eye came across. DOMONOSKE: Carl Nemeth works in the fraud division of Tower Hill, a Florida homeowners' insurance company. Over the weekend, he caught a cellphone signal near Panama City. There were still places it wasn't safe for his team to travel. NEMETH: But in situations like that, we're relying on aerial imagery and things like that. So if we can't get to the site or get a look at it, at least we can get a decent picture of what's going on. DOMONOSKE: And it wasn't just buildings that were devastated by the storm. CHRIS CHANDLER: A lot of areas have lost a generation of timber. Poultry farms are hit pretty hard. And the cotton industry is devastated. DOMONOSKE: Chris Chandler is an adjuster with Alfa Insurance in Alabama. He's been working in Houston County. CHANDLER: Cotton was ready to be picked last week and 60, 70, 100 mile-per-hour winds just blows it away. And that's people's source of income. That's their livelihood. DOMONOSKE: Early estimates suggest this hurricane caused billions of dollars of damage. Fitch Ratings says that insurance companies will have substantial costs. But Fitch also says the industry is, quote, "well-positioned to absorb the losses." And, yeah, that's what insurance companies are supposed to do. But in Florida in particular, every big storm raises worries that the industry will just fail. After Hurricane Andrew in 1992, many companies went bankrupt or backed away from covering coastal areas, so it's good news that analysts say that's not likely to happen now. But communities are still facing a long, difficult recovery. Chandler in Alabama says the damage is upsetting. CHANDLER: You wish that you could just snap your finger and make everything back to normal. Obviously that's not going to happen. And, you know, you're talking to people that houses - are destroyed, all their belongings, their children's pictures - no amount of money is going to get an image back of your parents that are passed away, of your child's first birthday. DOMONOSKE: While some things are lost forever, he says, communities are already working together to start to rebuild. Camila Domonoske, NPR News. (SOUNDBITE OF DAIGO HANADA'S "WEAK ME") Transcript provided by NPR, Copyright NPR.